Goll recalls her first case as a union executive member involved appealing the denial of disability benefits on behalf of a member, and the early successful appeal and satisfaction of restoring benefits for a member and their family has motivated Goll throughout her career to be actively involved in CUPE. For Goll, the joy of helping others you work alongside and looking out for their well-being is what makes a union a strong family. Marilyn Goll is regarded by many as a mother figure not only to her family, but to the union local, with the care and endless hours, evenings and weekends, dedicated to helping members. She is also known for not being afraid to speak up for members and the union contract. 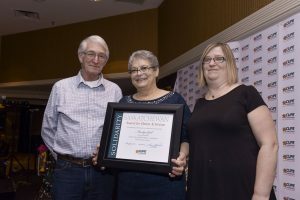 On March 8, 2018 during CUPE Saskatchewan’s Annual Convention, Marilyn Goll was awarded the CUPE Saskatchewan Activist Award for outstanding contributions to the Union. “CUPE is strong because of caring members like Marilyn Goll who show a passion for members’ rights and well-being,” said Judy Henley, CUPE Saskatchewan Secretary-Treasurer, in presenting the award during the Convention 2018 banquet. Marilyn Goll is a proud member of CUPE Local 5430 – the largest health care union in Saskatchewan, and former CUPE Local 5111 member.